Who was the gaucho? Was he the solitary man quick to pull his knife when in the company of someone who looked at him the wrong way, or was he the revolutionary known for his bravery and self-sacrifice? The answer is: he was both. To say the gaucho is important to Argentina is an understatement. He was and is real, and most definitely was a hero. The term “gaucho” may come from the Quecha word “huachu,” meaning orphan or vagabond. The gaucho of old was a solitary, hard-riding, hard-living, freedom-loving man. Intensely private, gauchos were (and are, but we’ll get to that later) among the most skilled horse riders and handlers you will ever have the pleasure of meeting. They come from a long line of nomadic horsemen. In the late 18th century gauchos roamed the pampas outside of Buenos Aires in search of wandering herds of cattle and horses. These nomadic riders spent days alone in the saddle; some say they even bathed on horseback. They tracked the herds down looking for their meat, hide, and other trade goods. Gauchos answered to no one but themselves. Social skills were consequently a challenge. Their idea of conflict resolution often had to do conflict itself, especially at knifepoint. After the Argentine War of Independence, however, the reputation of the gaucho took a seriously different and well-deserved turn. These gauchos became a key part of the revolutionary force that won independence from Spain. Their intimate knowledge of the terrain of the Argentinian pampas worked to their advantage, and made the gaucho the perfect freedom fighter in the war. Their self-sacrifice in that war is something the country will never forget, making them national symbols of honor, bravery and freedom. The gauchos carved their own culture in the pampas over time, including a way of dressing and dancing. From a distance you could see them coming. Most striking might have been the absence of the cowboy hat-silhouette we are so used to when we see a rider in the wide open spaces. Instead, many gauchos wore a signature cap, which was basically a wide-diameter beret, called a Boina. Their trousers (bombachos) were loose-fitting and sometimes gathered at the bottom, often hiding some seriously bowed legs (or so the story goes) from endless riding. A heavy woolen poncho, a knife (the facón) tucked into his belt, and a whip (rebenque) at his side rounded out the gaucho’s costume. It is still worn today during celebrations like December 6th, their national holiday. You’ll have the chance to see the malambo, the gaucho dance, if you are in Peru on December 6 (and, often, if you stay at the Estancia Ranquilco and attend an evening asado). The malambo is traditionally a male dance – a fleet-footed demonstration of prowess and endurance. In the years after the War of Independence the vast lands around Buenos Aires were developed into huge estancias, where gauchos often worked with cattle and horses once again, this time, for hire. As they settled, they carried their traditions forward, continuing to teach their children at an early age to ride and tame wild horses. Gauchos of the twenty-first century, though, can often now be found in 4 x 4’s instead of on horseback. Except at the estancia. Here, our gauchos live, work and play in many of the time-honored traditions of the past. The gaucho of old may be part myth, but our gauchos are real. Guests of the estancia are more than welcome to experience the gaucho way at the level they are comfortable. They can tend to their own horse before and after trips, or work alongside the gauchos, joining in any horse or cattle activities going on at the ranch. 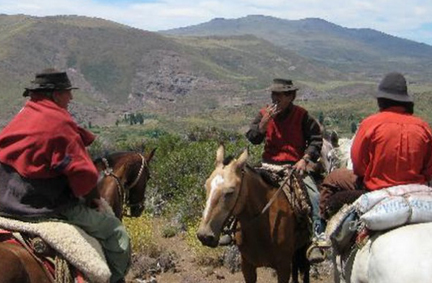 True representatives of the gaucho spirit, the gauchos at Estancia Ranquilco are skilled horsemen and cattle handlers. Even the most experienced guests often learn something new from spending time with them. Our gauchos are friendly and generous men who are passionate about their way of life. They welcome those who want to experience some of the beauty and adventure they know every day during life on the estancia. It’s one of many reasons to include a stay at the estancia as one of your holiday trips to South America.